Everybody seems to love a winner. While it can be annoying, becoming a bandwagon fan can be fun. Here is how to be a bandwagon sports fan. Choose a team that has enjoyed a good amount of success. Becoming a bandwagon fan of a very successful team will keep you from having to switch again next year. Fortunately there will be far fewer Red Sux fans a few years from now as their success was just a fad. Cheer for a player instead of a specific team. When that player leaves a team, cheer for whichever team he plays for. Be sure to choose a very talented player, though, as his team is more likely to be successful. In the Red Sux Bandwagon case, you will throw that player under the bus a la Manny Ramirez. Claim to have always admired your new team. Being a bandwagon fan involves a little bit of fibbing every now and then. We all know that there are tons of fibbers in Assachusetts. Buy cheap and generic apparel from your favorite team. Since you’re just a bandwagon fan, there is no need to spend $100 on a unique game-day jersey. If you root for the Red Sux, anything from clearance at Wal Mart will do. Once your team starts losing, stop cheering for that team. If somebody asks you about this, simply tell the person that you don’t really care all that much about this particular team, anyway. 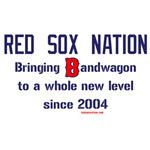 If you're a Red Sux fan, be loud and obnoxious anyways, and please go into every Anti-Boston Facebook page and type in all caps because that's just CRUISE CONTROL FOR COOL. Change teams every couple of years. A bandwagon fan has little loyalty to any one team. If another team becomes dominant, switch your allegiance to that team. Fortunately, many people who magically started wearing Boston caps in 2004 will become Yankees fans. This fortunate event will also coincide with many of them losing touch with their favorite college bong and throwing their beer pong table to the curb. Hey, we all made stupid choices in college, we just prefer the one's where our girlfriend made out with another girl (errrr sorry, you were rooting for the Red Sux then, you didn't have a girl friend). Don’t pay a lot of attention to your team until the playoffs. Everybody knows that bandwagon fans come out when their team is on the verge of a championship. Once the playoffs start, wear your cheap sweatshirt and support “your team” loudly.